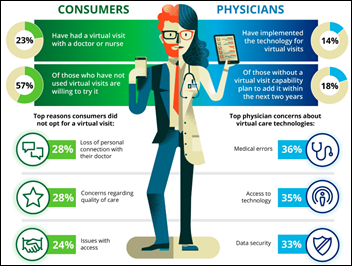 A Deloitte physician survey finds that while both consumers and doctors recognize the benefits of virtual care, most consumers haven’t experienced a virtual visit and only 14 percent of doctors offer them. The most commonly implemented virtual care technologies are email / patient portal consultations, physician-to-physician consultations, and virtual visits. Adoption was in the single digits for remote care management and coaching, remote patient monitoring at home or in other facilities, and integration of wearables. The factors listed above do not include the big ones that doctors can’t control — reimbursement and licensing. You can bet that they would be quick to offer those services if adequately paid to do so or if per-visit fees were eliminated under value-based care payments and an in-person visit actually cost the practice money. From DisCerner: “Re: Banner Health. CIO Ryan Smith has tendered his resignation and a posting is up for SVP/CIO on Banner’s site.” The job is posted here, although Ryan is still listed as CIO on the company’s executive page. His career was with Intermountain until he joined Banner in October 2013. He was paid $900K in the most recent year. The tax filings also indicate that Cerner was Banner’s third-highest paid independent contractor at $47 million. From Email Privilege: “Re: HIPAA. I was emailed a receipt after paying online that included my name, account number, date of birth, and telephone number. Should they not just have the account number and amount paid because of HIPAA?” All of those fields, as well as your email address itself, are elements of PHI. However, your use of the provider’s portal probably could be taken to indicate your consent for communicating by email (I bet that was listed in its terms of service). It’s also not illegal to send PHI by email – HHS’s only requirement is that the provider “apply reasonable safeguards,” of which encryption would be one even though the rule doesn’t specifically require it as far as I know. We are aware of the situation that affected a subset of our customers and impacted their operations for the past 24 hours. 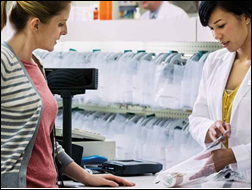 Though point-of-sale services were impacted, the dispensing of medication was not affected. We have resolved the issue and have informed customers of next steps. As always, we appreciate our customers’ support and thank them for their patience and cooperation. Welcome to new HIStalk Platinum Sponsor EPSi. The Allscripts-owned, Chesterfield, MO-based company is the industry leader in health system integrated financial decision support, budgeting, and planning. More than 900 US hospitals — including nine of the top 10-rated hospitals, 128 IDNs, and 40 global academic facilities — rely on EPSi for data-driven insight into managing costs and improving their long-range financial performance, as well as addressing requirements created by value-based care, bundled payments, accountable care, and continuum of care. 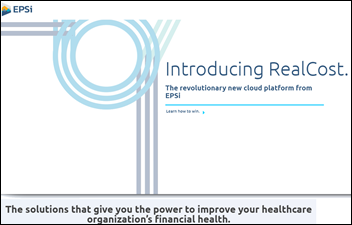 The company’s just-launched, cloud-based RealCost financial decision support and analytics system allows health systems to quickly gain deeper cost insights and empower informed decision-making. Check out case studies from Texas Children’s Hospital, University of Kentucky Healthcare, and UMC Health System. Thanks to EPSi for supporting HIStalk. Tenet Healthcare considers selling its Conifer Health Solutions business to UnitedHealth Group in a deal that could be worth $2 billion. Tenet hired Goldman Sachs last December to help it divest Conifer as part of a $250 million cost-reduction initiative that it aims to wrap up by year’s end. Vyera Pharmaceuticals, known as Turing Pharmaceuticals under the infamous leadership of now-incarcerated pharma bro Martin Shkreli, reports Q1 losses of over $1 million thanks to declining sales of Daraprim, the drug Shkreli infamously raised the price of by over 5,000 percent when he acquired it in 2015. Vyera is considering changing its name to Phoenixus, no doubt in an effort to shed its former association with Shkreli and revitalize slumping sales. 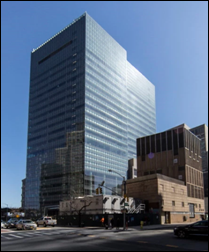 NYU Langone Health (NY) implements Omnicell’s automated medication management software and dispensing cabinets at its new inpatient hospital. Northwestern Memorial Healthcare (IL) selects HealthSource release-of-information technology from Ciox. 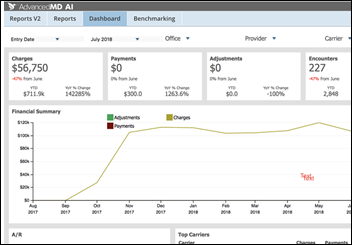 AdvancedMD releases a redesigned version of its AdvancedInsight financial reporting suite for private medical practices. Adam Boehler, director of the Center for Medicare & Medicaid Innovation, takes on the additional HHS role of senior advisor for value-based transformation and innovation. Methodist Hospital (KY) selects cloud-based backup and recovery software and services from CloudWave. A Health Catalyst survey on patient safety efforts across care settings finds that ineffective IT combined with a lack of real-time alerts is the biggest impediment to reducing medical errors. A lack of adequate staffing and budget is a close second. RxBenefit Clarity, a prescribing decision support solution developed by CoverMyMeds and RelayHealth Pharmacy Solutions, will be adopted by a dozen health systems that use Epic, Allscripts, and other EHRs. EClinicalWorks Director of Interoperability Strategy and Business Development Tushar Malhotra joins the CommonWell Health Alliance Board of Directors. FormFast and Kyruus will exhibit at the AHA Leadership Summit July 26-28 in San Diego. The Jacksonville Business Journal recognizes The HCI Group as one of the city’s fastest growing companies for the sixth year in a row. Impact Advisors promotes April Smith to principal. InterSystems will exhibit at the Defense HIT Symposium July 24-26 in Orlando. CoverMyMeds announces that its RxBenefit Clarity prescribing decision support tool, developed with RelayHealth Pharmacy Solutions, will soon be used by 250,000 providers via new integrations with a dozen EHRs and Epic health systems.